Book therapy for mental health:Can books heal you? 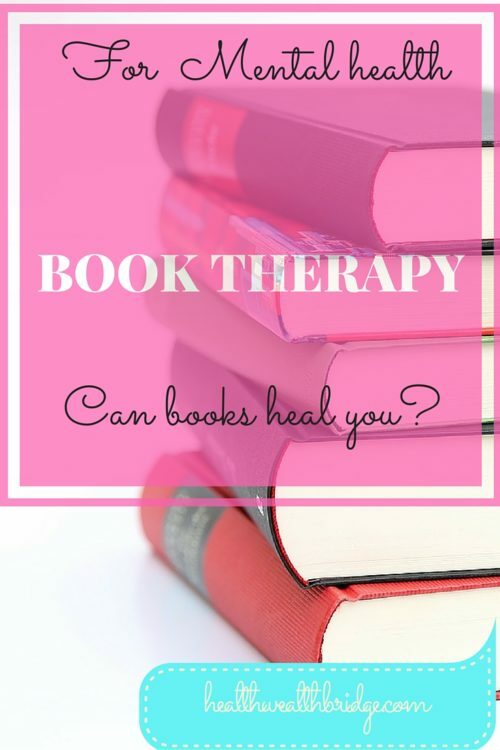 Home » Blog Healthwealthbridge » Book therapy for mental health:Can books heal you? What is your happy Book? What makes it your happy book? Why do you love reading it? Often in the daily business of everything, you forget to unwind. You need to take a short’ me time break ‘every day. Just like your body feels tired so does your mind too. The best breaks are those, that provide relaxation for both mind and body. Food for your health:Healthy diet. During my school days ,summer holidays meant devouring books .Morning noon and night . Stephen King says reading during meals can make you unpopular.I was scolded quite often for this naughty .My favourite is still a nail-biting murder mystery.But can’t really do the reading during meals in front of the little one. There’s something about solving a murder that makes me feel happy.When all problems seem too big.Solve a little mystery.That’s bound to help you feel better. Have you heard of bibliotherapy? Bibliotherapy is a little-explored branch. Books are researched as self-help aids in Cognitive behavioural therapy. A healthy reading list can help you heal from inside. It is used as an additive therapy.It can decrease antidepressant dosing and help prevent relapse(2-5). It usually contains information, descriptions of other people’s experiences or a workbook or cognitive behavioural therapy (CBT) techniques. Sometimes this can be used as preventive therapy too. depression ,but not keen or able to take antidepressants. Books can influence positively or negatively.Choose your reading list with care.Words can create magic.Words are powerful.That’s why reading is a self-healing habit. That’s why the “Chicken soup” series is so popular. What you put in your reading list is as crucial as what you put in your mouth. Have you ever used books to help you heal?Share your healing book in the comments below. Link to the Gutenberg library. 6)Reeves T, Stace JM. Improving patient access and choice: assisted bibliotherapy for mild to moderate stress/anxiety in primary care.Reeves T, Stace JM. Improving patient access and choice: assisted bibliotherapy for mild to moderate stress/anxiety in primary care. Director Alternative Development and Research Centre Jaipur. Writer having written several books and a column for a leading English daily Hindustan Times Jaipur edition. I was presented with the Star of Asia Award for my written and social work as I help poor slum children with education and health and organise skill development for poor women and older girls. This is completely new to me. Very informative. Thanks for sharing. Though any research is a good thing to happen to mankind but sometimes I feel we (humans) do get into research just for the sake of it and ends with testing the so crafty formed “Hypothesis”. In my opinion this is one of that kind of research as this exactly should be the second step of co – ordinated research activities. There is another research going on full – scale and that is to understand multi – intelligence” so that people of special needs can be addressed and their mental faculty(s) could be developed to full potential. And when we still do not know (this research is a conformation) about human brain (or mental faculty) dosen’t this research sounds as a hurried step or at least non – co ordiated effort. No harms if other things would have been normal but when 80% of the world’s population are having problems in meting basic needs, dosen’t this kind of spending sounds criminal. I agree with you about some of what you say.Significantly theses researches are happening mainly in countries where there already is social security. But learning to read a.K.a does help in alleviation of poverty.I come from a lower middle class background .Books helped me every step of the way. Thanks for such a thoughtful feedback.I appreciate it.